Just how and why a van – southbound on S.E. 82nd Avenue of Roses – happened to collide with a woman riding a bicycle eastbound into 82nd from the intersection at Henderson Street on the morning of October 15, still is unclear. When the first East Precinct officers arrived there four minutes after they were dispatched at 11:09 a.m., they came across a maroon Honda Pilot stopped, facing south, in the inside northbound lane of the Avenue of Roses – and the rider of a red TREK bicycle down on the pavement. Paramedics quickly prepared the bicyclist to be taken to a local hospital, telling officers that she was believed to have sustained serious life-threatening injuries. 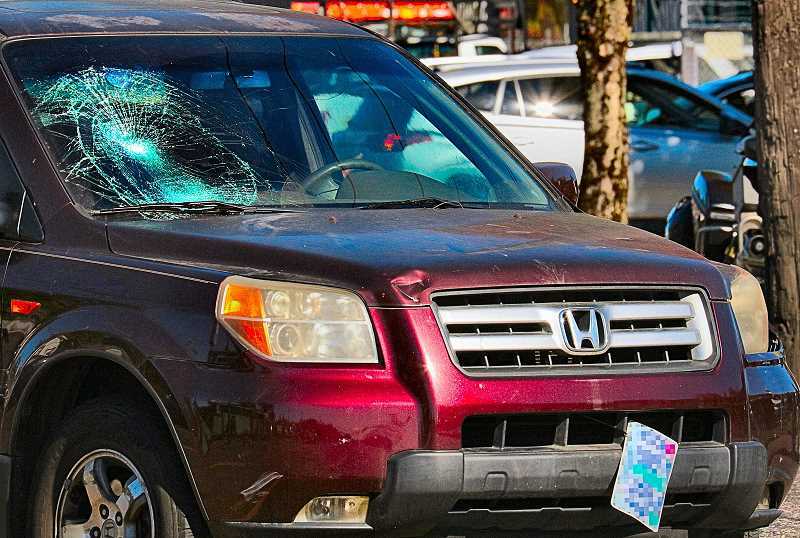 "Based on the severity of the woman's injuries, the PPB Traffic Division Major Crash Team officers assumed the investigation," reported Portland Police spokesman Sgt. Chris Burley. The cyclist died at an area hospital that same evening, Burley revealed the next day. All that's been made public from the investigation so far is that, somehow, the "bicyclist and Honda collided at the intersection of S.E. 82nd Avenue and Henderson Street". "The driver of the Honda remained at the scene and cooperated with investigators; there have been no citations issued or arrests made at this time," Burley told us. The following evening some 20 people, including the victim's brother and family members, gathered at the intersection for a candlelight vigil; later, police confirmed that the deceased had indeed been identified as 52-year-old Pamela Seidel. At the vigil, friends described Seidel as a kind and sharing person, despite having been homeless for years. A person close to Seidel said that she recently had moved into an apartment, had gotten a job at a nearby motel, and was receiving mental health treatment.